In this tutorial, you enable users to reset their passwords from the Windows 10 login screen. With the new Windows 10 April 2018 Update, users with Azure AD joined or hybrid Azure AD joined devices can use a “Reset password” link on their login screen. When users click this link, they are brought to the same self-service password reset (SSPR) experience they are familiar with. Hybrid Azure AD-joined, with network connectivity to a domain controller. You must enable Azure AD self-service password reset. If your Windows 10 devices are behind a proxy server or a firewall, you must add the URLs, passwordreset.microsoftonline.com and ajax.aspnetcdn.com to your HTTPS traffic (port 443) allowed URLs list. Review limitations below before trying this feature in your environment. If using an image, prior to sysprep ensure that the web cache is cleared for the built-in Administrator prior to performing the CopyProfile step. More information about this can be found in the support article Performance poor when using custom default user profile. 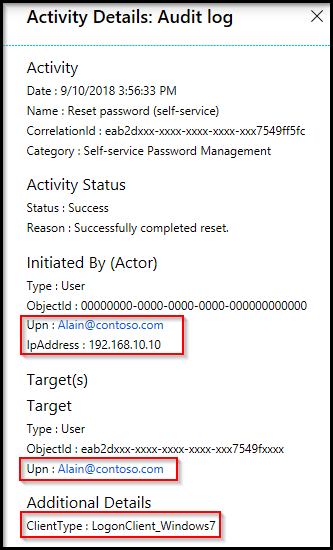 Deploying the configuration change to enable password reset from the login screen using Intune is the most flexible method. Intune allows you to deploy the configuration change to a specific group of machines you define. This method requires Intune enrollment of the device. Sign in to the Azure portal and click on Intune. Sign in to the Azure portal and click on Azure Active Directory. Under Members, choose the Azure AD joined Windows 10 devices that you want to apply the policy to. More information on creating groups can be found in the article Manage access to resources with Azure Active Directory groups. 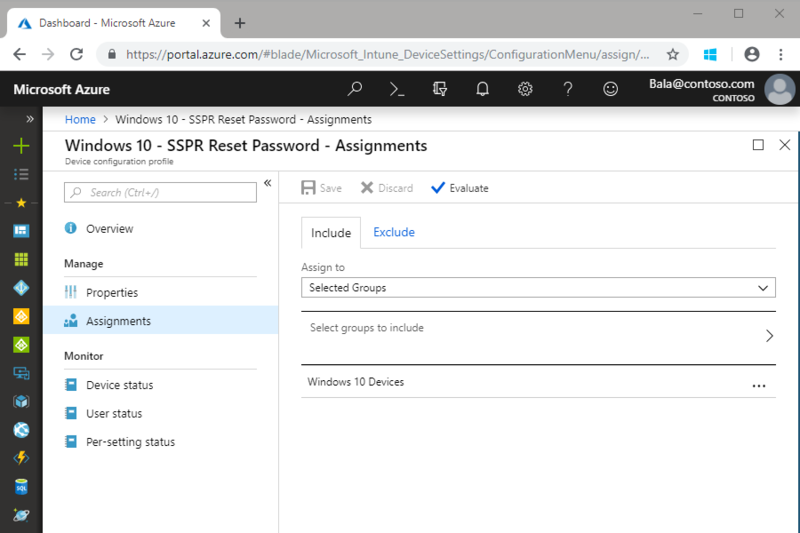 You have now created and assigned a device configuration policy to enable the Reset password link on the login screen using Intune. Now that the policy is configured and assigned, what changes for the user? How do they know that they can reset their password at the login screen? When users attempt to sign in, they now see a Reset password link that opens the self-service password reset experience at the login screen. This functionality allows users to reset their password without having to use another device to access a web browser. The Azure AD audit log will include information about the IP address and ClientType where the password reset occurred. When users reset their password from the login screen of a Windows 10 device, a low-privilege temporary account called “defaultuser1” is created. This account is used to keep the password reset process secure. The account itself has a randomly generated password, doesn’t show up for device sign-in, and will automatically be removed after the user resets their password. Multiple “defaultuser” profiles may exist but can be safely ignored. When testing this functionality using Hyper-V, the "Reset password" link does not appear. Go to the VM you are using to test click on View and then uncheck Enhanced session. When testing this functionality using Remote Desktop or an Enhanced VM Session, the "Reset password" link does not appear. Password reset is not currently supported from a Remote Desktop. If Ctrl+Alt+Del is required by policy in versions of Windows 10 before 1809, Reset password will not work. If lock screen notifications are turned off, Reset password will not work. This feature does not work for networks with 802.1x network authentication deployed and the option “Perform immediately before user logon”. For networks with 802.1x network authentication deployed it is recommended to use machine authentication to enable this feature. For Hybrid Domain Joined scenarios, the SSPR workflow will successfully complete without needing an Active Directory domain controller. If a user completes the password reset process when communication to an Active Directory domain controller is not available, like when working remotely, the user will not be able to sign in to the device until the device can communicate with a domain controller and update the cached credential. Connectivity with a domain controller is required to use the new password for the first time. If you decide you no longer want to use the functionality you have configured as part of this tutorial, delete the Intune device configuration profile that you created or the registry key. In this tutorial, you have enabled users to reset their passwords from the Windows 10 login screen. Continue on to the next tutorial to see how Azure Identity Protection can be integrated into the self-service password reset and Multi-Factor Authentication experiences.